The first thing I want to rave about is Eric Lanlard's show I've been watching on 4od. I have been meaning to write about this for ages, but unfortunately I just kept watching it instead. A couple of months ago I got a bit fed up of all the rubbish on T.V. so my lovely boyfriend suggests looking at all the food shows on 4od, and low and behold I found this little treasure. Baking Mad with Eric Lanlard has kept me quietly entertained for a few weeks now and I highly recommend it to any avid baking group or those of you who have more of a creative flair. I had never really heard of Eric Lanlard before, but since watching this I've had a good look in work and found two very good cook books by him: Cox Cookies and Cakes and Home Bake. Now, I'm still very new to this baking malarkey, so I personally would buy the book Home Bake, it seems a little more friendly and with a selection I could attempt. However, the Cox Cookies and Cakes would be my guilty pleasure because the food looks incredible! You can tell just by looking at the front cover! I will definitely be keeping a beady eye out for anything with this man's name on it. My second recommendation for Christmas would be Harry Eastwoods' Red Velvet Chocolate Heartache. I was first told about this amazing book by my good friend Caroline, and she has since let me borrow it and I have unsurprisingly fell in love with it. Harry Eastwood is well known from her assistance in the TV series Cook Yourself Thin, alongside one of my other favourite bakers and chiefs Gizzi Erskine. Considering that I've just told you that she was on Cook Yourself Thin, you might have already guessed that Harry has put a few twists and turns in her sumptuous recipes. 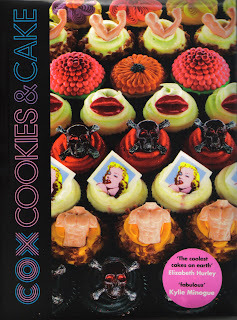 Yes, ladies and gents, Harry Eastwood has created this fabulous book filled to the brim with the most tantalisingly delicious treats, but without the guilt of eating millions of calories. It is clear from the very first page that Harry is a true lover of cake, but has made me and a lot of other people out there very happy, as she has adapted and created lots of lovely recipes to make them waistband friendly by substituting a few of those naughty ingredients for, wait for it.... vegetables! For awhile now I have heard about the use of courgettes in cupcakes, as they keep them nice and moist, but I must admit I struggled to see how other vegetables could work. Harry Eastwood has opened my eyes. If I get any money for Christmas it is going into buy this book! I can't wait to try and make Parmesan and Paprika Scones, that uses butternut squash, or, Forbidden Chocolate Brownies, which includes beetroot, but I am most excited about making the Caramel Swiss Roll with Passionfruit Cream! Scrumptious! If it wasn't clear from this rant I think I now have another baker to add to my list of favourites! My last little Christmas present idea is one I stumbled across in Boots, also with my friend Caroline, (we are becoming a right little baking pair). It is a Joules Baking Hamper. For just £40 the hamper is stocked to the brim with everything a starting baker would need, from a ceramic mixing bowl, icing shaker, cupcake cases, spatula, reusable icing bag... the list goes on. I can hear a few keen bakers out there tutting with disapproval. Yes, I would advise shopping around for some of these items and perhaps getting a more trusted and traditional baking brand, but, I think this is a brilliant idea for anyone, young or old, who are just starting out. Think of the fun you have on Christmas day, making lots of cookies or cakes! Now, if you've read all of this, first of all thank you it was a bit of a rant, but secondly I hope it's given a few of you a little help for any last minute gift ideas. However, I now need your help. I am stuck for what to make next, either Christmas cupcakes, or nice warm bread. I am slightly edging towards bread as I have never made it before, but cupcakes would be a nice little pudding on Christmas day, especially if I get a cupcake display set, which I've asked for. The choice is yours. Please vote by either leaving a comment below or replying to the link on my Facebook or Twitter!